Jobseekers! If the only thing you have done to find work is post your resume to a job board, you are missing out on countless opportunities. Stop doing what you have always done and implement a job search strategy that pays off now and for the entirety of your career. If you are unemployed, under-employed or unhappily-employed; the facts, ideas and methods in this book will help you find work quickly and keep you employed for years to come. And everything else that I forgot to mention in this description! “The #1 Job Hunting Book In The World” is presented in a conversational style and humorous tone that engages the reader throughout. The information is contemporary, relevant and practical enough for immediate application. Read this book and be inspired to actions that will cause opportunities to seek you out. If you have my permission to download this book, share it online, share it via email, share, share away. However, the right to bind it and sell it is exclusively mine. If you would like to purchase hard copies of my book, you can buy them (and my other books) on Amazon.com. EVERY job Iead I could give will come from that website, so do us both a favor and just go there. Thanks! 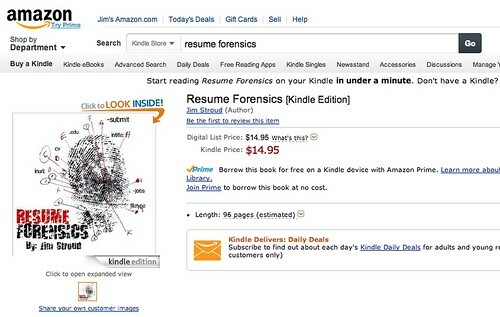 My book – “Resume Forensics: How To Find Free Resumes and Passive Candidates on Google” is now available for download on the Kindle. Download your copy now! RECRUITERS! Resume Forensics is a quick and easy guide to finding free resumes and passive candidates on the web. Heavy on visuals and light on text, this book is written and designed for the short attention span of recruiters, sourcers and the companies that employ them. JOBSEEKERS! If the only thing you have done to find work is post your resume to a job board, you are missing out on countless opportunities. Resume Forensics will open your eyes to how recruiters search the internet to find people who are not even looking for work but are being contacted for jobs that you will most likely, never hear about. Why not listen in on these recruiting strategies then, position yourself to be found? # How to find qualified candidates that do not have their resumes posted online. # What you should do prior to sourcing resumes online. RECRUITERS! Whether you are a novice to finding potential hires online, an expert or something in between; this book is filled with tips, tricks and strategies that you can immediately use to fill your open positions. JOBSEEKERS! Let the strategies herein inspire you to do something different. Take steps to attract hidden opportunities to you. Let’s make some money together! Join my affiliate program, refer my ebook to people and get paid $1 for every sale you refer. If you know a lot of jobseekers (and who doesn’t these days), money could add up pretty fast. (Just sayin’…) Details on my affiliate program are below. Near the bottom of the page is a link to an affiliate program. (Its in a blue box.) Sign up. You will be presented 2 options. Option one gives you a unique “jump link.” Tweet that link and when people buy my book, you get a $1 for each sale. Option 2 sends people directly to PayPal, but without showing them the ebook description. I RECOMMEND option one, tweeting your unique jump link. (Feel free to shorten it with bit.ly). Tweet, +1, Like and share your unique link with your network. Add your unique to your email signatures. Share the link with jobseekers you could not place (if you are recruiting). Thank you for partnering with me on this. If you have any questions, please reach out to me at anytime. UPDATED: 9.23.12 | My e-book now costs $0.00!!! Did you know that you are overlooking thousands (if not millions) of job opportunities everyday? I wrote an ebook on job / career hunting called “How To Find a Job Now (and never have to look for a job again).” I have already produced several videos on job hunting strategies, spoken at career ministries and job seeker events, written articles on how to find hidden jobs, contributed to a few books, participated in podcasts and achieved some notoriety in the recruiting world but, I do not have a book of my own. It has been suggested to me on several occasions that I should do so and I feel that now is the right time. I was quoted in: Globe and Mail, US News and World Report, Wall Street Journal and The Atlanta Journal and Constitution. Monster.com, Entrepreneur Magazine, Black Enterprise and The HR Examiner have all cited my contribution to job seekers. I have been involved in the recruiting industry for over a decade and have worked for such companies as Google, Microsoft, Siemens, MCI and a host of startup companies. I have produced award winning blogs, been featured in several leading publications and have been cited several times for my digital influence. Check out my LinkedIn profile to learn more about me and to network. Okay, I’ve rambled on long enough. Click here to read my ebook fullscreen and to give unemployment a punch in the face. (Boo-yaah!) Or, click here to download a copy of my e-book.